The Alexander Bay area is possibly one of South Africa�s best-kept secrets. It has been, and still is, protective of its mineral riches, hence the security. These days there are still checkpoints on entering the town, but behind the militaristic looking buildings lies the River Mouth of the mighty !Gariep (Orange), flocks of delicate pink flamingos, and stories of the old coastal diamond town waiting to be told. In the mid 1920s, when diamonds were discovered in Alexander Bay, the town became a hive of activity. It is recorded that 14,000 carats were once unearthed in only 6 weeks� mining! 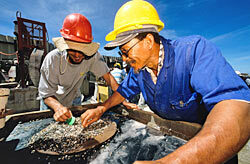 For the last 75 years the diamonds extracted here have been of extraordinary quantity, quality and diversity. The diamondiferous gravel in the town makes for the glimmering multi-coloured roads of agates, garnets, quartz, bright green epidotes and blood red jasper, to name but a few. In 2003 a small west coast marine dredging operation discovered the Cirrus Diamond, a fabulous 111-carat gemstone, under the icy waters at Alexander Bay. All mining has come at a price and inevitably created a threat to the natural environment, although some rehabilitation initiatives are now underway. Mining has also denied local people access to certain areas in the Richtersveld, particularly the coast, which has abundant resources. On the other hand, restricted access has ensured that some sites remain relatively pristine, such as the seal colony, the marine life, and the extraordinary bird populations. Over 200 species of birds can be seen here, including the rare Barlow�s Lark, which is found nowhere else but in this region. In fact, the Orange River Mouth is home to many rare and threatened bird species, as well as a critical stop over for migratory birds�and well worth a visit. The Alexander Bay Museum, housed in the old military base offices, is populated with artefacts from the old mining house and the mining community, as well as fossils that were discovered during mining operations. There are also local paintings and interesting relics of a past age, and a myriad of stories about the previous inhabitants of the area, diamond prospecting, and the life of the old diggers and the SAP security. The Diggers Camp, overlooking the Orange River Mouth, and the Muisvlak Motel, based on an old mine dump, are further reminiscences of Alexander Bay�s mining history. The mine tour takes visitors to the fascinating mining sights to learn about Alexander Bay�s secrets. Departing from the museum, the tour unveils workshops, prospecting trenches, and mining sites with bedrocks in the mining area. Also included is a drive along the west coast to visit the harbour and the seal colony, and to taste fresh oysters straight from the water at an oyster farm. Along the Orange River, a number of farms offer a peaceful escape from town. Surrounded by green fields of lucerne and the sweet smell of citrus orchards, these farms are also close to the river for a refreshing swim or to look at the wondrous pebbles and rocks, fish, birds, flora and wild life� or even to spot the ghost of the Humphrey, the last Orange River hippo who died in the rich muddy waters in 1921. Other attractions are an ostrich farm and the traditional Nama matjieshuise. South of Alexander Bay and half way to Port Nolloth, the Holgat River, with its dramatic canyon walls, serves as a hiding and breeding place for birds of prey. These huge creatures, as well as owls and large crows, are often seen along these coastal roads. Mine Tour: The tour enters restricted territory to visit to an operational diamond mine, as well as an oyster farm and a seal colony along the coast. 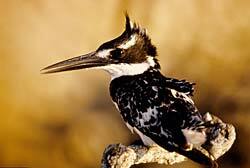 Orange River Mouth: Declared a Ramsar Site or Wetland of International Importance, the mouth of the Orange River is a birdwatchers� paradise. Lichen Hill: An example of the unique plant adaptations to Richtersveld�s arid climate, the bright orange lichen hill is the only one of its kind in the country.